This antique style wall clock looks as if it came from a Paris flea market measuring 10" in diameter also available in 12.5", 14.5" and 19.5", 23" in diameter. The background color on this wall clock is a light cream. This antique style wall clock is exclusively hand made in the USA with fade-resistant inks, the artwork is carefully mounted on a laser cut 1/4" thick wood panel. A special UV resistant coating is then applied with a brush for a durable textured finish. Quartz operated American made movements are used. One AA battery required, not included. Clock hands are slightly aged to match the vintage look of the artwork. 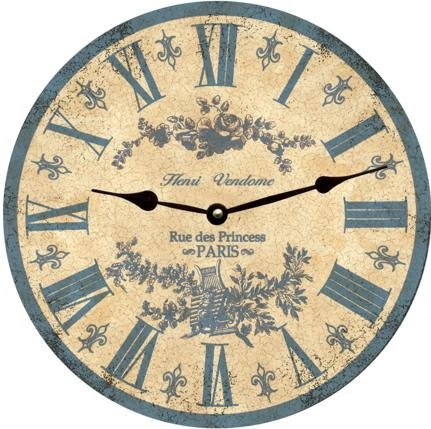 This antique style wall clock is made to order and will be shipped in 5-10 full business days.